Here are fishing articles published by the COAF Field Team related to Trout Fishing in Texas. We hope the articles prove useful to our Readers in their pursuit of these scrappy little fish! Guadalupe River by Camp Huaco Springs: Suggested Areas for Rainbow Trout Fishing – Each year Texas Parks and Wildlife stocks community lakes and ponds and a few tailraces/rivers with Rainbow Trout. Camp Huaco Springs is one location stocked through this Program! 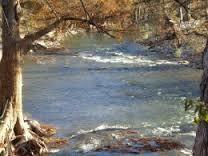 Guadalupe River by Lazy L&L Campground: Rainbow Trout Fishing – Another location on the Guadalupe River that offers Rainbow Trout fishing is Lazy L&L Campground! It’s just upriver from Camp Huaco Springs and is in the Special Restrictions Zone that sets a minimum size and daily limit for Trout. Guadalupe River by Rio Raft Company: Suggested Areas for Rainbow Trout Fishing – This location offers another opportunity for Rainbow Trout fishing. Rio Raft Company is further upriver from Lazy L&L but remains in the Special Restriction Zone. Guadalupe River Rainbow Trout Fishing – Re-published article that provides Guadalupe River Rainbow Trout fishing formation. Originally posted as a Squidoo Lens, the article has been updated and is available on HubPages.